The Wells Class is a 29th Century Federation built Temporal Science Vessel, designed to maintain the integrity of the timeline. Named after the 19th Century author H.G. Wells, the Wells class was only encountered the once by Captain Kathryn Janeway on the U.S.S. Voyager when it was lost in the Delta Quadrant in the year 2375, where the Captain attempted to stop sabotage of Voyager over the course of a five year time frame. The ship used for this, the Relativity-G, was a highly advanced time ship that’s central mission was to uphold and maintain the timeline. Recently, some of these ships have fallen through temporal anomalies created by the Tholians during their new incursion into the Alpha Quadrant, and Starfleet has managed to obtain these highly advanced vessels, but mostly stripped of their technology. The Wells is far more advanced vessel than anything in the current time period, however it is presumed that the ship has very limited technology compared to 29th Century starships because of the competitive nature of the ships in modern times. Whilst the ship appeared to have used Antiproton beam arrays and Chroniton torpedoes, the ships main feature is its temporal drive and the ability to use time itself to assist it in dire situations. The ship is capable of rewinding time several seconds to a point before a specific decision is made, allowing an alternate solution to be used in its place. The Wells also has a counterpart, the Mobius Destroyer. The Mobius is the Wells Class in the Mirror Universe, also from the 29th Century, but features a far more aggressive arsenal than the Wells. However, due to these vessels also coming into the hands of the Federation, Starfleet has also been able to exploit the abilities of the Mobius and the Wells and combine them onto both ships, allowing unique temporal technology to be developed centuries before its time. It is also believed the Klingon Empire has found vessels of their own, similar if not identical in nature to the Wells and Mobius. The Wells, and its counterpart the Mobius, have been kept top secret by Starfleet Intelligence until they could be redistributed for Starfleet use in the fleet. Adapted with modern technology, the Wells and Mobius time ships are not as powerful as they would be in the 29th Century, but are fearsome adversaries nevertheless. The D’Kora Class is a Ferengi built Marauder, designed to function to serve as a Freighter for the Ferengi Alliance, exporting and importing trade goods to and from the Ferengi Alliance. The Ferengi were first officially encountered by Starfleet in 2364 when the U.S.S. Enterprise-D followed a Ferengi D’kora Marauder to the Delphi Ardu System believing the ship to possess a stolen weapon. Whilst this contact was officially recorded to be the first encounter, previous incidents with the Ferengi were realised after extensive searching through Starfleet history, stretching back as a far as 200 years to the 22nd Century. The Marauder has also been known to serve as a Ferengi Battle Cruiser, possessing impressive firepower and the ability to survive over an extended period of time in certain circumstances. The ship is also equipped with a Battle Module, which allows the Marauder to literally transform into a configuration designed specifically for combat situations. Using this module and combining it with an EMP Pulse Generator as well as Swarm Missiles, the Marauder has its own fair share of fearsome weapons to hold its own in combat situations. The Marauder has always traditionally been a freighter-type ship and is intended by the Ferengi Alliance to fulfil this role, however, should the ship find itself under attack, enemy ships will find more than they bargained for when trying to raid a Ferengi Convoy. 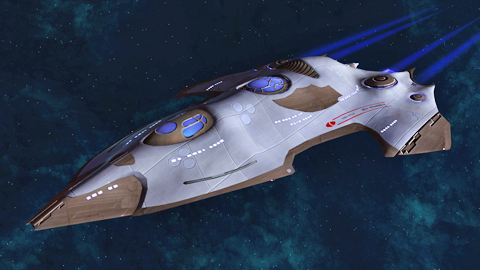 The Odyssey Class is a Starfleet built Star Cruiser, designed for exploring the vastness of the stars. A recent development in starship designs, the Odyssey is named after the destroyed U.S.S. Odyssey Galaxy Class starship that was lost in the Gamma Quadrant 39 years ago. As Starfleet's new official flagship, the Odyssey is the new pinnacle of starship design technology, featuring a long-standing development by the Starfleet Corps of Engineers, the ability of Saucer Seperation. This feature allows a starship to seperate its Saucer section from the Stardrive section of the ship and form two indepent mobile functioning starships. This design was first used in common construction on the Galaxy Class starship and was first used by the U.S.S. Enterprise-D in 2364. The first Odyssey Class starship, the U.S.S. Odyssey, was launched at Utopia Planitia with the registry "NCC - 97000". The prototype performed exceptionally well in simulations and extensive field testings and was pitched against the new Klingon Flagship, the Bortas. 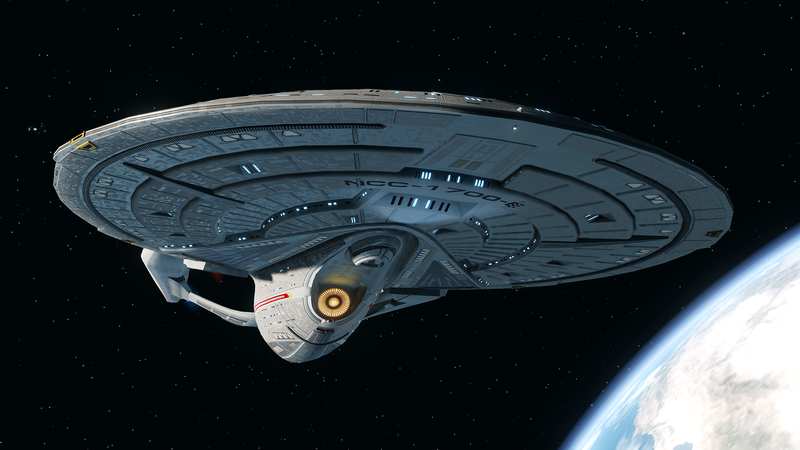 The Second Odyssey Class starship is the U.S.S. Enterprise-F (registry NCC-1701-F)however any details of this vessel have not yet been released (including the launch date or its crew). These days however, the Odyssey has become the new leading starship in the fight against the Borg and the decaying battle against the Klingon Empire. Being very large and able to pack a formidable punch in combat, the Odyssey will become a vital ship for years to come.